Here is a mystery: Cardinals Care, the official charity of the St. Louis Cardinals, is making hundreds of thousands of dollars in unusual payments to the St. Louis Cardinals every year. Presumably there’s some straightforward explanation for this, but we can’t tell you what it is, because Cardinals Care really doesn’t want to answer any questions. Note the $347,298 that Cardinals Care paid to the St. Louis Cardinals LLC, listed as an independent contractor, in exchange for “office space, utilities & the use of administrative personnel as needed for a fee based on the cost of services provided pursuant to a written agreement.” The dollar amount fluctuates, but this payment from Cardinals Care to the St. Louis Cardinals has been noted on every 990 from 2008-2013. 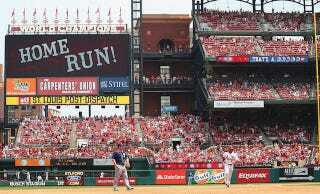 These yearly expenses stick out in part because Cardinals Care, which is itself an arm of the St. Louis Cardinals organization, is headquartered in the St. Louis Cardinals’ stadium. Every MLB team has an analogue to Cardinals Care—a charity that is headquartered in the team’s stadium offices—so we went looking for the most recent 990s of as many MLB charities as we could get our hands on. Out of the 21 990s we looked at, not a single one listed an expense similar to Cardinals Care’s yearly payment to the team that operates it. As far as we can tell, the Cardinals are the only team in baseball charging its own charity hundreds of thousands of dollars for the use of office space and utilities. In an effort to gain some clarity, we reached out to an analyst at CharityWatch, an organization that grades charities based on how much money they are actually putting back into the community. CharityWatch told us that there’s no way to really make out what’s going on with these payments without an explanation from the charity itself. We reached out to the Missouri Attorney General’s office to see if there might be more detailed information in the charity’s annual registration filing, but Cardinals Care is a 501(c)(3) and thus exempt from registering with the state. Over the last few weeks, we have sent nine emails to the Cardinals Community Fund inquiring about this subject. We have also left multiple phone messages with the charity. The one time we were able to actually speak to someone in the office, we were told that someone would call back with an answer. Nobody ever called back. Without further explanation—the sort that might be laid out in the written agreement mentioned on the 990—this looks like the Cardinals using their official charity to redirect money back into their own pockets. That may not be what’s happening at all, though! This could be something totally innocuous, but we won’t know that until the charity gets back to us. That’s why we’ve sent so many emails to and left so many voice mails with Cardinals Care. Seriously, you guys, just email us! Someone from the Cardinals finally emailed us back! We believe this structure between the team and its charity is very favorable to Cardinals Care, and allows for an efficient use of dollars to go towards grants and programs – all of which further the mission of helping kids in the St. Louis community. We remain curious about just why the Cardinals do things so much differently than other major league teams, and just what the specific advantages of charging their own charity for office space and administrative staff are.